Whitefish Mountain Ski Resort (formerly called Big Mountain) sits just north of Whitefish in Northwest Montana and is the second largest ski area in the state. 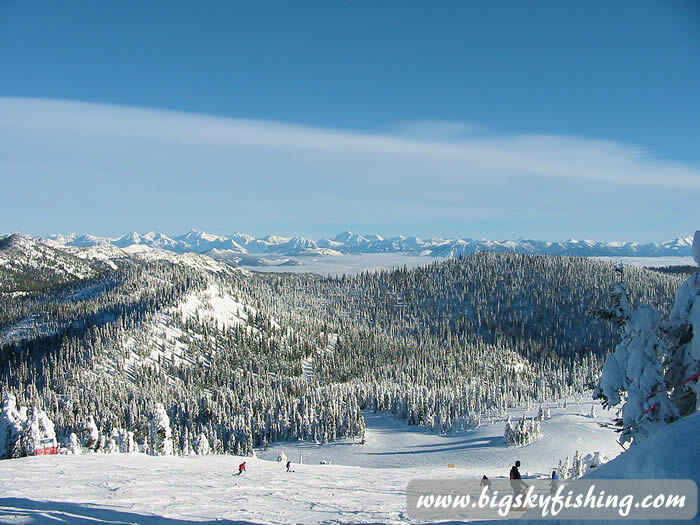 Whitefish Mountain, owing to its large size, has skiing for everyone, from quality intermediate ski runs to powder skiing to bump skiing to tree skiing. Not that many years ago Whitefish Mountain was just another local ski area. That has all changed, though. Large housing and condo projects have been and are continuing to be built on the mountain. The entire village area has been completely re-done and now resembles the type of villages seen at other major ski resorts. And, perhaps not surprisingly with all the changes, lift tickets have become increasingly expensive. 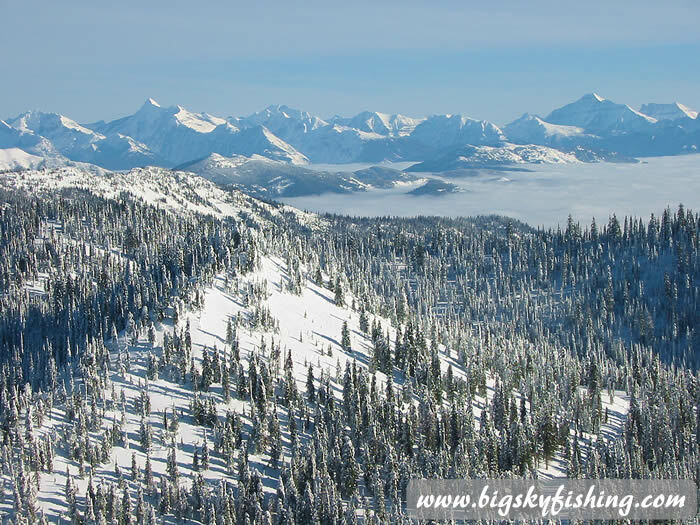 Whitefish Mountain is built on a mountain that is aptly named—Big Mountain. While the summit of Big Mountain is only 6817 feet, the summit looms nearly 4,000 feet above the valley below. The ski area itself has a lift served vertical of 2080 feet on the southern side and 1200 feet on the northern side. But more than just the vertical rise, Big Mountain is, well, simply "big." Since the mountain contains no jagged peaks, cliffs or extensive rocky areas, every acre of the entire mountain is skiable. The result is that Whitefish Mountain has skiing on over 3300 acres. When looking at the trail map, new visitors may be less than impressed. And indeed, for a mountain of its size, Whitefish Mountain has a limited designated "trail network." But don’t let the map mislead. The entire mountain is fully accessible, providing for superb skiing for anyone who enjoys tree skiing, powder skiing or bump skiing. Due to the sheer acreage, it is very easy at Whitefish Mountain to find “powder stashes” many days after a snowfall. And speaking of snow, Whitefish Mountain gets plenty of it. During a normal winter, the resort receives 330 inches, leading to a packed base of more than 100 inches on the higher elevations of the mountain. Lift lines are a mixed bag at Whitefish Mountain. Between Monday and Thursday, during non-holiday periods, there are few lines anywhere on the mountain, although on occasion a very short line might develop on the main lift, the Big Mountain Express. However, during holiday periods or on the weekends, expect some potentially lengthy lift lines on the Big Mountain Express lift. Since this lift is the only lift that leads from the Village to the Summit, it receives much more use than the other lifts on the mountain. On the weekends, to avoid the lift lines consider using either the express lift on the northern side of the mountain or the Swift Creek Express. Unlike most ski areas in Montana, visitors to the ski area have no shortage of slope-side lodging or dining options to choose from. Several hotels and numerous condo developments are available for overnight stays. And the many restaurants, ranging from normal ski area fare to exquisite dining, are all located in the Village area. Reaching the mountain is easy too. For skiers without their own vehicle, a free shuttle bus, called the Snowbus, runs between the Mountain Mall in the town of Whitefish and the Whitefish Mountain Base/Village area throughout the winter. The Snowbus stops at many local hotels in town, including the Whitefish Lake Lodge, the Pine Lodge, the Rocky Mountain Lodge and the Good Medicine Lodge. As the Snowbus schedule changes each season, be sure to download the latest schedule. Those with their own vehicles will also find the journey to Whitefish Mountain a simple one. Up until 2009, the road to the ski area (called Big Mountain Road) wasn’t the most pleasant of mountain journeys due to numerous sharp switchbacks and steep grades. Happily, improvements and re-routing on parts of the road have made the drive to the ski area free of the nail-biting drama that was once common driving to the ski area. Spanning more than 3300 skiable acres, Whitefish Mountain provides a huge variety of terrain for skiers of all abilities, with enough variety to prevent getting bored even during a week of hard skiing. While the mountain has many excellent groomed intermediate trails and a nice beginner area, the best skiing at Whitefish Mountain is off-trail. As such, adventurous intermediate skiers (those who want to ski off-trail in areas that aren’t too steep and expert skiers in search of the steeps, the bumps and the trees) will especially enjoy skiing at Whitefish Mountain. Whitefish Mountain lacks certain types of expert level type terrain found at other ski areas, such as Big Sky and Bridger Bowl. There is no real chute skiing, and while many trails are steep—the trails still can’t compare to some of the death-defying and lengthy steep trails found at Bridger Bowl or Big Sky. However, what Whitefish Mountain may lack in extreme steep or chute skiing, it makes up for in exceptional tree skiing. Whitefish Mountain has, by far, the best tree skiing in Montana. Anyone who loves tree skiing will have almost 3000 acres of trees to explore. Some of the tree skiing areas will be steep, others of more moderate grade, and some almost too level to ski through when the snow is wet or heavy. But best of all, the tree skiing isn’t confined to one particular area of the mountain. The tree skiing at Whitefish Mountain is, quite simply, everywhere. 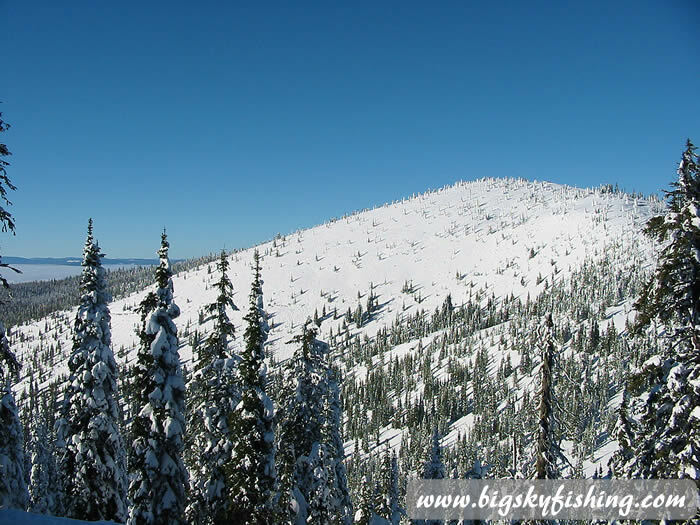 Whitefish Mountain has three distinct sections—the southern section, the northern section and the Hellroaring Basin section. Each of these distinct sections is detailed below. The southern section of Whitefish Mountain consists of the front of the mountain, or the part visible while standing in the village and base areas. The southern section of the mountain contains about half of the skiable acres at Whitefish Mountain and all but three of the lifts. The vertical rise on the southern section is 2078 feet, which is the vertical rise of the primary lift—the Big Mountain Express. The southern section of Whitefish Mountain contains the widest variety of terrain on the mountain. All beginner runs are located here, as are about half of all groomed intermediate runs. The beginner runs are nicely segregated away from the rest of the mountain and has its own lift, the Tenderfoot Triple. The trails served by this lift are perfect beginner trails since few skiers of intermediate or advanced ability ever ride this lift or use these beginner trails. Additionally, several fairly easy intermediate trails are also accessible by using the nearby Swift Creek Express lift. Many well-groomed intermediate runs snake their way down from the summit. Excellent intermediate ski trails that begin from the summit on the southern side of the mountain include Inspiration, Toni Matt, Corkscrew and Big Ravine. Numerous other well-groomed intermediate ski trails begin at the top of the Swift Creek Express lift, which is located next to Big Mountain sports. As a side note, on weekends or holidays, the Swift Creek Express lift doesn’t have the sometimes lengthy lift lines that the Big Mountain Express lift has. Many excellent expert level ski runs are also found on the front side of Whitefish Mountain. One of my favorites is Good Medicine, which offers excellent tree skiing while providing great views, all at the same time. Other excellent expert trails include Big Face, Langley, Powder Bowl, Schmidts Chute, Elkweed, and Fault 1-3. And for skiers searching for "eastern style tree skiing," take a trip down the short but fun ski trail called Woodlot. 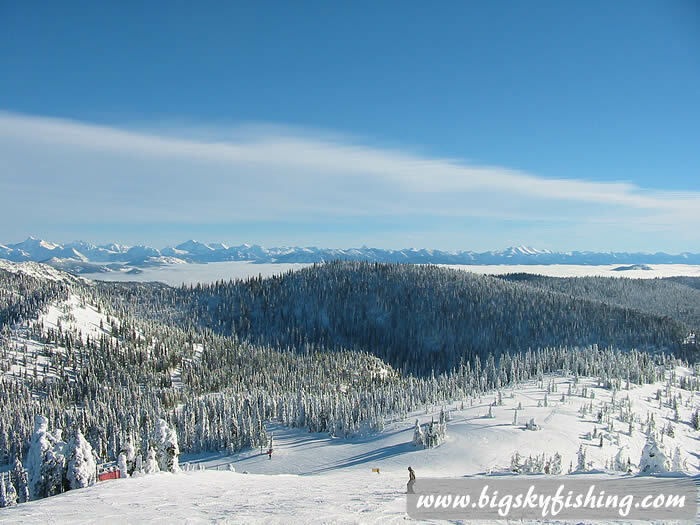 The southern section of Whitefish Mountain has a couple of double diamond (true expert only) ski runs, called East Rim and Fish Creek. These are true double diamond trails in that they are steep, narrow and rocky—although a bit short in length. There is one run that is best to avoid on the southern section of the mountain. The trail Russ’s Street is the longest ski run on Whitefish Mountain, but it also becomes very flat for most of its length once below the summit. Beginners might enjoy the trail, but for everyone else, use this trail only as a route to get somewhere else. The Northern section of Whitefish Mountain almost always has the best skiing conditions due to receiving more snow and its northern exposure, which inhibits melting and icing. However, the vertical rise on this section is only 1000 true vertical feet. Additionally, there is a bit of a flat run-off on the lower parts of all trails on this section of the mountain. There are no beginner runs on the northern section of the mountain, although some of the intermediate trails, once below the summit, are quite easy to ski and always well-groomed. The intermediate trails on this part of Whitefish Mountain are fun to ski on, if not the most challenging. Due to the good snow conditions and extensive grooming, ice is a rarity on these trails. For this reason, this part of the mountain is an ideal place for cruising and practicing carved turns. Expert skiers will also find several good trails on the northern section of Whitefish Mountain. These expert level trails have one defining characteristic for the most, they are very steep just below the summit and then flatten out considerably as they merge into the intermediate trails below. While these expert level trails are short, they are steep, bumpy and true expert level trails in every sense of the word. There are two chairlifts on the northern section of the mountain. The primary lift is the Big Creek Express Quad which runs to the summit. A new lift, the Flower Point Triple, opened up some additional intermediate and off-trail skiing terrain from a smaller peak called Flower Point. The Hellroaring Basin section of Whitefish Mountain is the "crown jewel" of the ski area, in my opinion. It is unspoiled, undeveloped, not heavily used and provides extensive off-trail skiing among a wide variety of advanced terrain. During good snow conditions, Hellroaring Basin provides challenging skiing on more than 1000 acres. Additional acreage can be found by sneaking out of bounds hiking to the top of Hellroaring Peak. Once there, a huge expanse of powder skiing awaits below, with a skiable vertical approaching 2000 feet. Hellroaring Basin is not for beginners or intermediate skiers. There are no beginner runs in Hellroaring Basin, and only one groomed intermediate trail called Hell Fire. Hell Fire is less a trail than a Forest Service Access Road that is covered in snow during the winter and then groomed. The primary use of Hell Fire is to mark the outer boundary of Hellroaring Basin and to provide a easy route to the only lift in the Basin. Instead of having a multitude of groomed trails, Hellroaring Basin consists entirely of ungroomed advanced and expert trails. Skiing ranges from open bowl type skiing to thick tree skiing, in both powder and in the bumps. Really, nature more than anything else determines the trail conditions in Hellroaring Basin on any given day. Following a snowstorm, the entire basin will consist of powder skiing among the trees. As the days go by, some areas will still have nearly untracked powder conditions while other, more heavily used areas, will develop sizable bumps on steep terrain. There are several marked "trails" in the Hellroaring Basin. But these aren’t trails in the true sense of the word. Instead, they are better called "routes." A skier accesses these "routes" at the signs, but once below the signs the skier just makes their own trail to the bottom since no designated trail exists. Skiing in the Hellroaring Basin isn’t for wimps. The skiing, even during good snow conditions, is challenging. During bad snow conditions it can be darn right dangerous. As all the snow is of the natural kind, all sorts of hidden obstacles await the unsuspecting skier. As the area has many trees and some rocky spots as well, a fall the wrong way can lead to a nasty injury. Also, intermediate skiers who wish to test out Hellroaring Basin should be aware that, once in the Basin, there is no turning back. Once a skier leaves the Hell Fire trail (which forms the outer boundary) and drops down into any of the expert "routes" below, it can be extremely difficult if not impossible to "hike back up" to the trail if a skier finds themselves in terrain that is too advanced for their abilities. Also, be prepared for thick tree skiing in spots. The upper part of Hellroaring Basin is only partially or lightly wooded. However, the lower half of the basin can be heavily wooded in various spots. While there are many ways to avoid the thick trees, sooner or later most people find themselves lost among the thick trees. A skier who can't make fairly tight turns in deep snow among thick foliage might struggle skiing in Hellroaring Basin. Accessing the Hellroaring Basin at Big Mountain is easy. Just hop on the boring Hell Fire at the summit. Follow it a short distance and then just jump off the trail when something looks interesting below. Only one lift serves Hellroaring Basin, and that chair doesn’t lead back to the summit. Instead, the lift leads to the ridge above the village area, right behind the Swift Creek Express Lift which is on the southern side of the mountain. To get back to Hellroaring Basin then requires skiing down to the main Big Mountain Express Lift and taking it back to the summit. 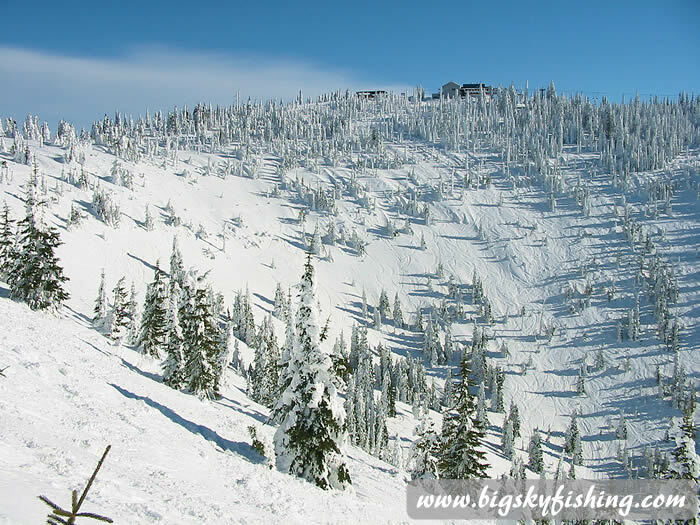 Whitefish Mountain offers skiers of all abilities excellent skiing in a very scenic setting. While Whitefish Mountain is now a true resort like those found in other big name areas (with prices to match), the skiing is still excellent. In particular, the tree skiing at Whitefish Mountain is unmatched in Montana. And due to the usual bountiful snow cover, the mountain usually has a very solid base by New Years. Terrain : 15% Beginner, 35% intermediate, 45% advanced/expert. Note, these numbers only include designated "trails," and don't include all the off-trail skiing options.